In the Islamic tradition, the duality of light and shadow forms the basis on which colour is seen. In this primarily metaphysical view of the phenomenon of colour, light and shadow represent the latent possibilities of heavenly archetypes. In light, God is manifest as the source of all being, and the gifts which light brings are beauty, purity, brilliance, greatness, power and benefit — «rang», the Arabic word for colour, is the equivalent of all these meanings. Two creative areas are open to mankind: alchemy, as the «Science of Transformation of the Human Spirit» (of which the knowledge of colours forms a part), and the traditional crafts (mosaics and miniatures, cloth, carpets and glass). Both alchemy and the traditional crafts represent the two methods available to human beings in their contemplation of the processes of nature. These art forms, with their symbolic value in both the religious life of Islam and everyday life, also exist on the mystical plane. The mosaicist takes part in a process of alchemy both physically and spiritually, and the selection of colours symbolises a certain state of knowledge. The arts, to be understood as the union of the human self with divine reality, strive in their different forms for a state of purity, which is then made spiritual. Mysticism has the same goal — it, too, strives for the transformation of its soul. But mysticism exists beyond the temporal, where the world of colours serves as its sole guarantee of direction and orientation. The Islamic system of colours is arranged on three levels: on the first level, the system of the three colours and the system of the four colours exist independently; the second level defines a system which concerns itself with the number seven as the sum of three and four; the third level is occupied by a system comprising 28 colours, i.e. 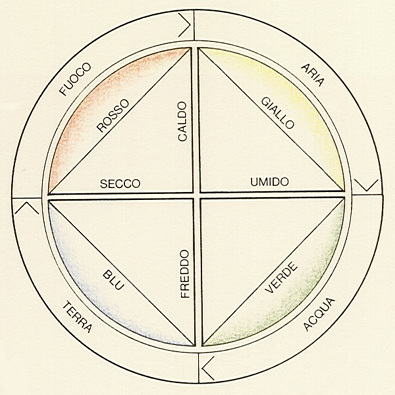 the fourfold repetition of the system of seven colours. The system of three colours includes white, black and sandalwood. All other colours exist within white, which is therefore pure and unspoiled. White is the light of the sun, received as a manifestation of divine power which allows the colours to flow forth. The third colour is sandalwood, the colourless earth and the neutral basis on which nature (the system is explained below in the system of four colours) and the polar properties of white and black take effect. In the subdivision representing the material world, the yellowish green to golden brown of the sandal tree is characterised by sandalwood — hard and aromatic, suited to carpentry and the extraction of essences. The small illustration combines the three colours into a triangle to reflect the three fundamental Islamic concepts of body, mind and soul. As already seen with Robert Grosseteste, black is ascendant and active, while white is descendant and passive. Sandalwood ensures the necessary expansion of the natural gradations of brightness: horizontal, neutral. Prayer in Islam conforms to the same movement. 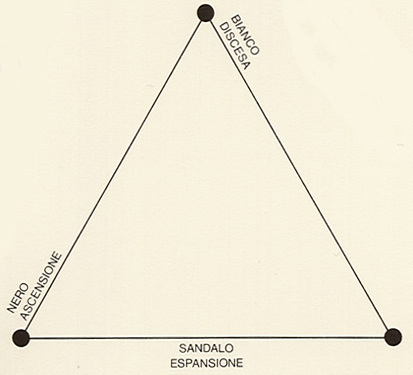 The system of four colours, based on opposites, is seen adjacent to the connective system of three. It contains red, yellow, green and blue, which are each assigned a quality of matter — an element. Red is fire, yellow is the air, green is water and blue is the earth. The four active qualities of the universal soul are placed opposite the four passive qualities of matter — warm, cold, moist and dry, and since two of these qualities correspond to each element, they are placed on the half diagonals of the square inscribed within a circle. Fire is therefore warm and dry; air is warm and moist; water is moist and cold, and the earth is cold and dry. If both these systems are combined, the system of seven colours will arise. The number seven is of great cosmological significance, and so each colour can be assigned to the traditional seven visible planets. 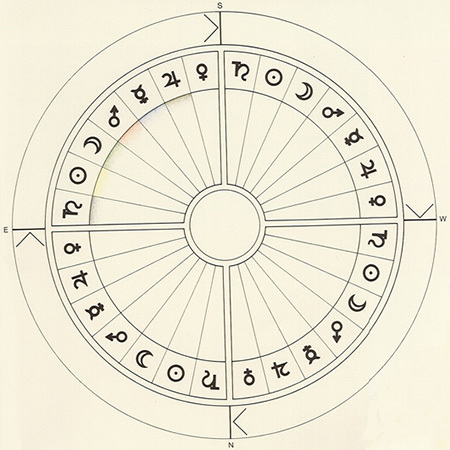 Based on the Egyptian system, the following series will be formed: black, signifying Saturn, followed by yellow with the symbol of the sun; green associated with the moon (the favoured colour for crests and flags in the Islamic world), red with Mars, blue with Mercury and sandalwood with Jupiter. White completes the series and belongs to Venus. These seven planets relate to the seven prophets Adam, Noah, Abraham, Moses, David, Jesus and Mohammed, while an alternative allocation relates to the seven metals: lead, iron, tin, gold, copper, mercury and silver. In the large illustration representing the system of 28 colours, the circle is divided into four quadrants. The solstices and equinoxes or the four points of the compass are assigned to the diagonals, and around the circle the seven colours are inscribed four times, together with their corresponding planetary signs. An identical layout to the system of four colours (or the elements assigned to them) results from this subdivision, and this clearly explains that microcosm and macrocosm both conform to the same structures. In this illustration, the actual sequence of the colours is characteristic: white and black follow each other at the transition to the next quadrant, although black, seen in the clockwise direction, is located at the beginning of the series, and white is at the end. These two colours, which point to the original duality, lie to each side of the transition from one quadrant to the next, and thus mark beginning and end. Additionally, a secondary system of axes is formed by the diagonal centerlines of the four whites, which thus introduce a dynamic acceleration into the model of the 28 colours (seven times four). Bibliography: N. Ardalan und L. Bakhtiar, «The Sense of Unity, The Sufi Tradition in Persian Architecture», London 1973; John Gage, «Colour and Culture, Practice and Meaning from Antiquity to Abstraction», Thames and Hudson, 1993, pp. 61-64.